Posted Oct 25, 2017 by Eds. In a 2013 contribution aimed at influencing the post-2015 development agenda, seventeen UN Special Rapporteurs recommended that the Sustainable Development Goals (SDGs) should include a goal on the provision of social protection floors. In April 2015 the UN Committee on Economic, Social and Cultural Rights (CESCR or the Committee) issued a Statement on ‘Social protection floors: an essential element of the right to social security and of the sustainable development goals’. In September 2015 the SDGs were adopted by the General Assembly with the first Goal to ‘End poverty in all its forms everywhere’. Among the key SDG tools to achieve that noble objective is the target to ‘Implement nationally appropriate social protection systems and measures for all, including floors, and by 2030 achieve substantial coverage of the poor and the vulnerable’. A review of CESCR’s Statement identifies several ways in which the Committee incorporates capitalist assumptions that are anathema to its aim of ensuring socio-economic rights. The assumptions are then positioned as preconditions for the realization of human rights. Instead of probing the terms under which ‘many developing countries have [… ] experienced relatively high growth rates’, the Committee hitches the social protection agenda to the existence of that growth to argue for ‘access to the resources needed to initiate and progressively implement social protection programmes’. 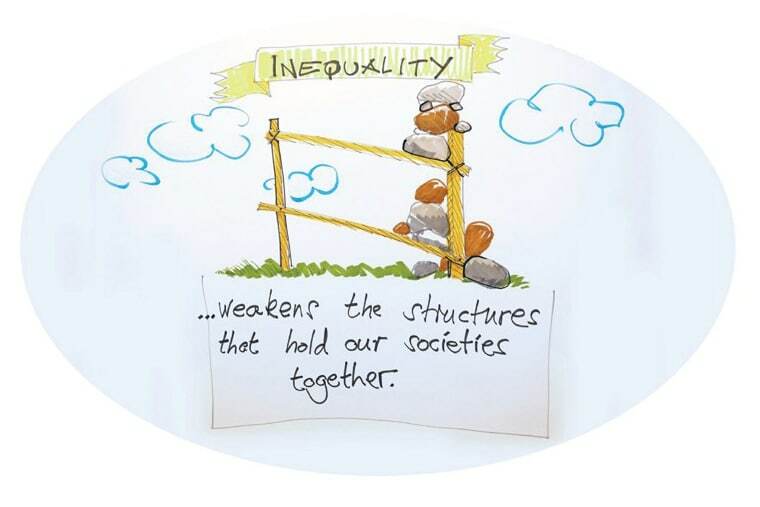 The Committee’s ‘reaffirmation of the redistributive character of social security’ to meeting basic needs and furthering equality left there obscures the economic arrangements that engender poverty, inequality and alienation in the first place, arrangements upon which the Committee relies. Growth (and profits, which for all intents and purposes are the same thing) is a condition for the survival of capital. Far-reaching cross border trade, investment and finance is thus judged successful to the extent that it leads to more capital accumulation for the owners and managers of capital. In its wake is left multiple forms of dispossession and displacement including the destruction of non-market economies, and, along with them, of alternatives. The Committee has long emphasized that the Covenant is politically and economically ‘neutral’, and that its principles are subject to realization within any number of systems be it ‘a socialist or a capitalist system, or a mixed, centrally planned, or laissez‑faire economy or upon any other particular approach’. But its willingness to endorse the means by which growth today is achieved, with all the attendant harms and dislocations of economic globalization, is to allow for the transfer by the state of the profits of the transnational capitalist growth economy to the subsistence economy, which is to help sustain and legitimate the capitalist growth economy (see Partha Chatterjee on legitimating post-colonial capital). The problem then, is that the Committee endorses social protection floors without challenging, at the same time or fully, the fierce means by which they will be provided for. This would include support for a conventional model of economic growth without accounting for its contradictory effects, including that it inevitably creates poverty. What we see is an endorsement of the mainstream commitment to capitalist growth even if to the ends of national redistribution. What is required to address this quandary is a far greater awareness of how the interpretation of international human rights law within an era of global neoliberalism sees transnational growth fetishized as an essential precondition of human betterment and how distributional and ecological violence prefigure seemingly progressive social policies. The interpretation and application of international human rights law has a foremost function under conditions of economic globalization: to ensure that its terms do not help reproduce the violent appropriations that sustain globalization. This would offer an important first step in the ‘neutral’ application of socio-economic rights, as has long been their claim. While the Covenant and its elaboration and interpretation by the Committee have been effective in protecting certain people from some socio-economic harms, neither the Covenant nor the Committee’s interpretation of it reflects neutrality. It is clear that the Committee seeks to see respected, protected and fulfilled socio-economic rights, it seeks to defend people against the worst excesses of capitalism, including through advocating for social protection floors. However, the (often tacit) acceptance of the legitimacy of transnational capitalism, even while seeking to soften its worst tendencies, is to take a position: It is to endorse this capitalism and its world order, whatever attempts are made to protect its victims. This is but one example of what the sociologist Anthony Woodiwiss refers to as the human rights paradox: that ‘human rights are intended to protect potential victims by declaring aspects of their lives sacred, but they also contribute to the continuation of the possibility of abuse by protecting some of the activities that gave rise to the same abuse’. To begin the process of overcoming this paradox it needs to be consistently exposed. Thus along with its mandate to protect the most vulnerable, the Committee on Economic, Social and Cultural Rights could endorse social protection floors but it should also state that in doing so it does not necessarily endorse the means by which the needed redistribution is made possible. The ‘predistributive’ requirements would then be the subject of a separate and related inquiry into compliance with the Covenant. For an insightful consideration of these issues see, B Akbulut, F Adaman and YM Madra, ‘The Decimation and Displacement of Development Economics’ 46 Change and Development 4 (2015) 733. A Woodiwiss, Human Rights (Routledge 2005) 10.